Delivery to Anywhere In North America! Utilizes CNC technology for absolute precision. Our products are fabricated by a high-quality team of experienced workers. Aluminum composite panels with up to a 30 year warranty. Whether you are looking for product information, have a technical question, or simply would like to request a sample, we are here to assist you. One of our highly trained professionals will respond promptly. 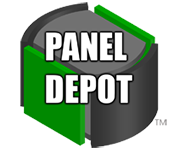 Panel Depot specializes in the fabrication of quality aluminum composite wall panels. With exceptional service, we provide a wide array of options, customized to any project. We are customer driven with a proven system that provides on time, quick deliveries.